Fergal O’Donnell reflected on his team suffering a convincing defeat. Roscommon players troop off after yesterday's defeat in Croke Park. ROSCOMMON’S RISE HAS been one of the most eye-catching football tales to date in 2016. Having been promoted from Division 2 last spring, they held modest aims of survival in the top tier. But the Rossies exceeded those expectations to reach yesterday’s league semi-finals before enduring a sobering experience as they were decisively defeated by Kerry. “That was always the danger, that you’d make a semi-final and come up very short,” admitted manager Fergal O’Donnell afterwards. “We were 1-6 to two points down before it started. We were really looking for a performance but we were just outclassed. “Kerry were more experienced, better players today. We’ve a long way to go to match them. “I thought maybe we were a little bit in awe of them. I think we may have got a bit of stage fright out there. “There has been a lot of media about us getting there. The Mayo game showed our shortcomings. We know where we’re at. “The biggest thing we find is game awareness. The decisions that we make under pressure. Back in February, Roscommon claimed a famous win over Kerry in Killarney. 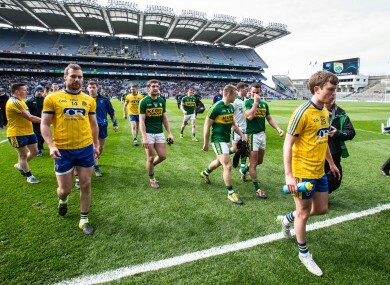 When the teams came to renew acquaintances yesterday, Roscommon were facing a far stronger Kerry outfit while their own squad was slightly stretched. “I’m not making excuses but we had guys who would have figured earlier on in the league who weren’t even on the bench today,” outlined O’Donnell. “That was one concern that we had, that three or four guys who will figure later in the year weren’t available today whereas Kerry you could nearly look at their bench and they were full strength. As they draw a line under the league campaign, Roscommon’s gaze switches to the championship summer. O’Donnell knows they must perform to get up to challenging the elite. “We know we’re not in the top four teams in the country. You look at the likes of Tyrone coming up, they’d be miles ahead of us and we know that. “There’s lots of teams that aren’t there (in Division 1). But at the same time, an All-Ireland is a long way away. “We’d be looking (to see) can we contest against the best teams in Connacht, (against) Mayo, we haven’t contested in the league again this year. “For Roscommon last year maybe we were talking like that and when we came up to some of the other games, we didn’t perform. Email “'I think we may have got a bit of stage fright' - Rossies league journey ends”. Feedback on “'I think we may have got a bit of stage fright' - Rossies league journey ends”.